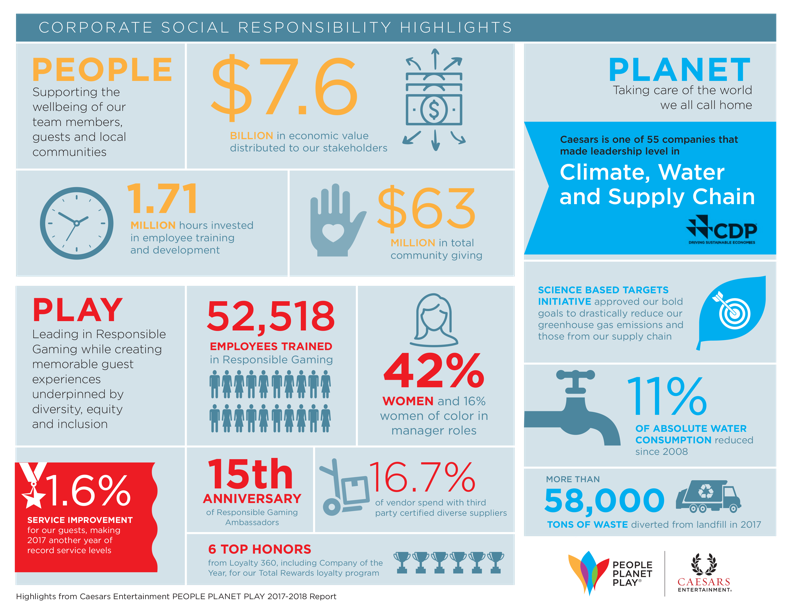 Caesars Entertainment Corporation (NASDAQ:CZR), the world’s most diversified gaming and entertainment company, announces the launch of its 9th annual corporate social responsibility (CSR) report, PEOPLE PLANET PLAY, which details sustained progress against the company’s CSR goals in 2017 and the early half of 2018, and its continued commitment to its employees, suppliers and communities. PEOPLE PLANET PLAY is the company’s guiding CSR framework, encompassing plans, initiatives and programs to advance the way Caesars Entertainment and its affiliates make an increasingly positive impact in society. Caesars’ commitment to long-lasting, positive societal impact on the communities in which it serves was recently recognized by Civic 50, a Points of Light initiative. This is Caesars’ fourth year on the list and its third time as the leader of the consumer discretionary industry. Caesars’ award-winning Wellness Rewards program saved employees a total of more than $30 million in 2017. Caesars’ company-wide environmental strategy, CodeGreen, continues to lead the industry and the corporate sector in general. Caesars is one of only 55 companies worldwide to achieve an A or A- score in three CDP rankings; the company was included in the Water A List and ranked A- for climate change disclosure and A- for supplier engagement. Caesars established the gaming industry’s first responsible gaming efforts almost 30 years ago. For 15 years, the Company has deployed Responsible Gaming Ambassadors at each property; there are currently 880 Responsible Gaming Ambassadors across North American casinos. Caesars continues to expand its global reach by bringing renowned hospitality, dining and entertainment experiences to Meraas’ Bluewaters Island Development with the first two non-gaming Caesars resorts. Additionally, the Company plans to open a non-gaming Caesars Palace luxury resort along the coast of Puerto Los Cabos, Baja, Mexico. Gwen Stefani’s new Las Vegas Residency, “Gwen Stefani – Just a Girl” at Planet Hollywood Resort & Casino adds to Caesars’ more than 10,000 live entertainment shows annually. For more information on Caesars’ Corporate Citizenship, please follow @CitizenCaesars on Twitter or Facebook and visit the Corporate Citizenship blog at www.caesarscitizenship.caesarsblogs.com.